Last November I believe just after Thanksgiving, while fishing a stream with which I'm very familiar with I caught a wild Tiger trout. It was taken just a hundred yards or so from the first photo. I had been fishing streamers and wets without much success. Although the streams waters were cold I thought it would have been a better day. As I approached a very good holding area of water I let the wet fly drift. Suddenly the line tightened and I knew I had a hookup. The fish put up a good fight and as I moved my hand under its belly to lift him up I noticed it was not a brookie but a tiger. This is the tiger that was taken in November. They are found in in streams where browns and brookies exist. They are very tenacious and they are not afraid to smack the same fly twice and three times. While fishing the same stream this year in late April, just about twenty five yards from where I caught the tiger in November, I hooked a very strong fish. When it came to hand it to was a tiger. A photo was taken and the tiger was sent on his way. When I got home, I looked closely at the tiger. It looked very similar to the one I had taken in November, only somewhat larger. I'm not a biologist so I could not say for certain if it was the same fish, but it sure looks like it to me. In the course of our lives we hit some bumps in the road. Sometimes these are small ones and sometimes they are big. We all find our ways of handling them, and no one way is best. It's how we choose to deal with them that is best. I would like to share my way of smoothing out one of lifes big bumps. Jeanette and I visited a few of Connecticuts wonderful woodlands and streams. The forest is so full of life now, everything from flowers to deer to toads to chipmonks. While walking and listening the rushing waters as they crash over the boulders your mind becomes clear and free from the recycle bin which holds most everything. As the day ended I still had the memory of this beautiful peaceful place. Mountain Laurel as it blooms is here for but a short time. Our eyes take in its beauty and place it where it can be retrieved when needed. Wild free flowing streams keep crashing over boulders and bumps as they have over thousands of years. There life is endless, unlike others. "Goodbye Bob"
Memorial Day 2012. As we enjoy this holiday with family, friends, or by ones self. Cookouts, baseball, fishing and boating, or whatever pleases you to do in your free time. Just take a few moments to reflect on the meaning of the day. So many have sacrificed, and some made the ultimate sacrifice to enable us to enjoy this day. Yesterday was one of those classic late spring days. It had rained the day before so the morning broke with a half sun, with clouds and fog in the mix. The air seemed a bit muggy and the threat for a shower or two did not alter my plan of fishing this little stream. As I started my walk along the stream the sun was making starting to filter through the trees. It was to be a peek-a-boo type of day with the clouds. The stream is well shaded and the water seemed cool to the touch. But at this time of year I like to check the temps just to be sure. So I dropped in the thermometer in and it read 60 degrees. While I observed no rises, not that there weren't any, I tied on a wet fly. the Red Pin. I fished the fly in the riffles leading to deeper water with undercuts. Soon there was a strike and a brookie was at hand. These types of places on small streams always hold a fish or two. The only drawback is that one hookup will cause such a ruckus that it's best to leave and rest the spot. The woods after a rain are wonderful. The smells are intoxicating, and the leaves are so vibrant, and very wet. This makes for some damp t-shirts and jeans. This one spot I drifted the fly into with the hopes of working it alongside the undercut bank. As the fly reached the tip of the log a flash came from the undercut and this brook trout took the fly. It all happened within a heartbeat. "Brook Trout" faster than a speeding bullet, able to strike a Red Pin, and give the holder more pleasure then can be measured. 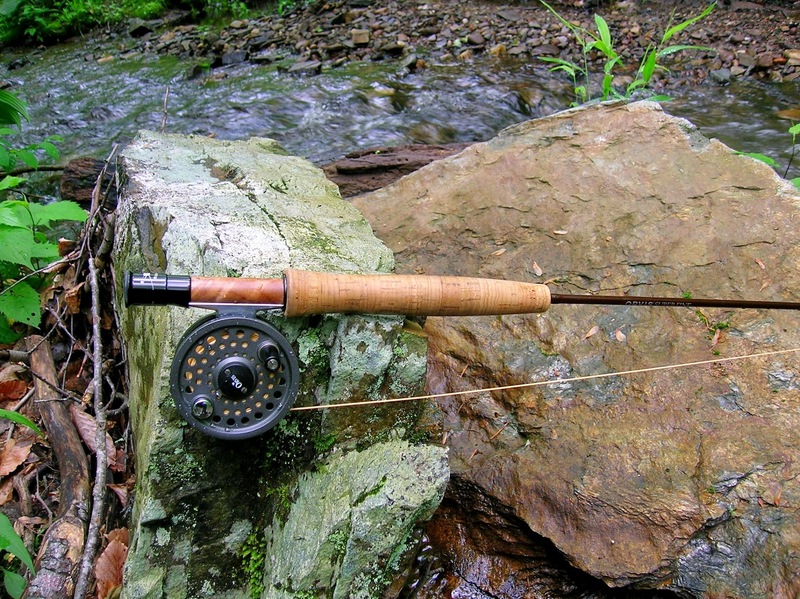 An Orvis Superfine fly rod. It's a 6ft 4wt full flex, coupled with an English made Battenkill reel. It's a great small stream rod and reel. I purchased this combo about 6 years ago and have only fished at perhaps a dozen times. There is a reason, and I questioned it in a email to Orvis. The rest of the story will follow in a later post. May so far has been wonderful. We have had a fair amount of rain, cool nights and warm days. This has led to some fine fishing and equally fine woodland viewing. All along the streams the plants and trees are so green and full providing cover and shade. We fished one little stream Saturday. We arrived about the time breakfast was starting, although no one was in the chow line. I fished a wet fly and had a strike or two, even managed a couple to hand. Kirk's efforts were similar. As we continued to fish upstream it was apparent the fish were going to be a bit tricky today needing coaxing from undercuts and other difficult places. I changed to a Bomber and fished it into those special places. This effort brought several jewels to hand. Oh those little hiding places. This one particular run, I fished it for a bit. I cast the fly and let it drift several times without a look. After moving out, Kirk moved into position to fish it. His first cast brought a quick response and a brookie came to hand. I managed to fool this guy with a Bomber. He came from a tricky place like you see in the photo below. After looking at this brook trout I noticed how much they look like the greenery that surrounds their watery home. My first visit to the State of Vermont was back about 1972. We had taken a vacation there. I had a 1971 Volkswagen Beetle a little four year old daughter and not much money. Vermont at that time was a magnet for those who had various life styles and ideals that were a bit different than the norm at the time. Hippies and communes were more plentiful then brook trout. Now when I look back to that time it doesn't look so bad. After visiting Vermont last week I can say it's just as beautiful as always. And Flower Power is alive and well. Coffee houses are very plentiful and hellos are said frequently. We stopped at a diner on our climb through the Green Mountains. The diner is an old one from way back. Lots of coffee and served there over the years. A Vermont country breakfast with coffee...5.99.. Free refills on the Java. The Green Mountains. Lots of beauty and history. Ethan Allen, and the Green Mountain Boys called this home. Last August tropical storm Irene came through this area and wreaked havoc not seen before. The amount of rain was so heavy and for so long. The rivers went totally wild and out of control sweeping away highways, bridges, homes and forever changing the lives of the people who live here. These are a few photos of some of the streams in the Green Mountain National Forest. The high water marks on these waters was incredible. The people of Vermont are strong and are helping to rebuild and return to normal. While Irene impacted all of us in New England, Vermont was probably hit the hardest. I went out today with the thought of testing a new fly. Well not a new fly but a variation of an old fly. I tied a few Picket Pins using peacock herl dyed red instead of the natural green herl. So packed with some of the red ones and my 7ft 5wt I began walking upstream. I have fished this stream before but I fished it downstream and only once did I try on the up side. Access to the water is tricky in spots, and in others it's like a pond. The fly worked as I had hoped. It brought many brook trout to hand. They took the fly in fast water and in the real slow stuff. I fished this one particular pool, it was so slow it was like fishing a pond. The fly was allowed to sink to the bottom then retrieved and they hit it hard. The 7ft 5wt came to good use. That extra foot of rod made casting a little easier. These are a few of the brookies that enjoyed the Red Pin. This pool produced a very big fish, unfortunately he won the battle and swam off with my fly. For those who have been following this blog know of the love I have for this fly. 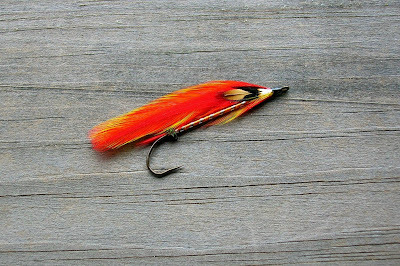 I have posted many reports of the success I've had with this wet fly. One of the reasons for the success of this fly is that it represents a variety of insects. If you look at it the first insect to come to mind is a caddis, or a stonefly, maybe a beetle or a cricket. It also can be fished as a dry, with a little floatant it can be made to hang near the surface, then pulled and it becomes an erratic struggling meal. A bit of sink putty and it's a good nymph. But it's best use is as a wet fly, cast downstream and stripped back. Vary the speed and you have a very good trout catcher. The Picket Pin is a simple pattern. Few materials are needed, peacock herl, brown hackle and squirrel tail. Tying it is not hard and most can tie it with ease. Even if the finished fly is a bit off it will still take fish. 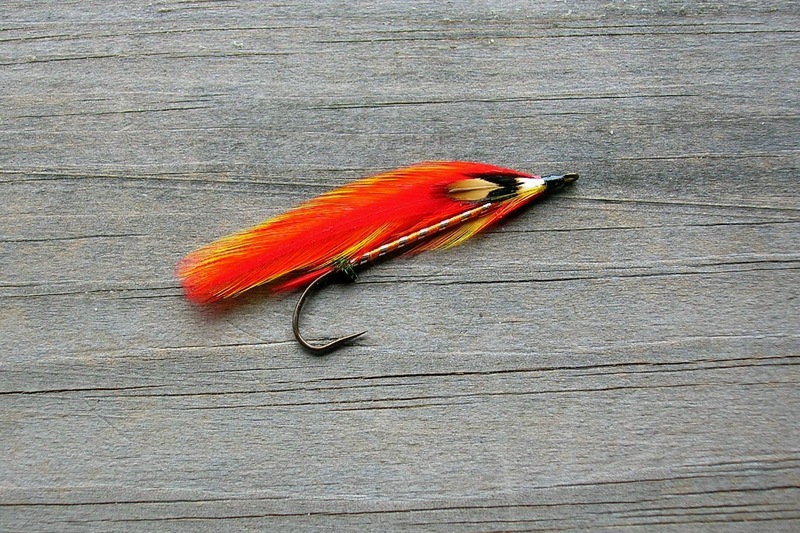 I tied a version of The Pin using some peacock herl that was dyed red. When finished it looked OK. But the test would be on the stream. So yesterday I gave it a run and it did very well for itself. That report will come later. For those of you who have just started tying flies try the Picket Pin. Another variation the Picket Pin streamer. I am saving this for a larger river like the Farmington. The second stream. This stream is but a few miles from the the first stream and generally flows through the same terrain. I seem to like it for its scenic, and so quiet, not to mention its brook trout are very friendly. The day started out on the cool side, I was glad I threw the flannel shirt in the car the night before, it felt great under the fleece jacket. I stopped at a Dunkin', which was nearby, for a coffee and a raisin bagel. I drove to the stream and parked alongside and enjoyed my breakfast as the sun filtered through the woods. At that time of day you can expect to see most anything and I looked to see if I could catch some wildlife moving, but that was not to be. So I finished breakfast and rigged up and started my quest. The stream affords you some easy access and some tough areas. Briars are exceptionally sharp this year. I cast my first offering of the day into a long smooth run, a Picket Pin wet fly. I stripped the fly slowly and lifted the rod at various times. On about the fourth time a form appeared from no where to take the fly. Soon a brook trout lay in the water along the bank waiting for a photo. This was not to be for he soon turned and was back home in a second. The stream is like a Thomas's english muffin, full of nooks and crannies, light and shadow. But when your fly is in the right nook a wild brook trout will oblige. As I worked my way down the stream and the sun filtered on the stream it appeared the trout, at least a few were on the rise. I changed flies and tied on a dry. It did not take to long before one of this streams colorful residents took the fly. A quick photo and a thank you and he was on his way. Although I do enjoy the two streams I have told of, this is my favorite. How do you fish a place like this? This was supposed to be a post about a trout stream, the second stream I mentioned in my last post. So why the watermelon cut up in a bowl? Well I could say it's part of my new healthy choices lifestyle or I could sat the truth. I screwed up. What the hey. On one my outings I spotted a mallard hen standing on rock in the middle of the stream. She paid no attention to me. She was focused on the far bank. I thought she may have had a few chicks there for safe keeping. Upon further inspection I noticed there were no chicks. Suddenly a dark form went streaking downstream. The form was recognized as a trout. Mildred the trout pointing duck. This streamer was created with some materials that had accumulated on the desk. It's really "Knotfancee"
Well it was probably not what you were expecting, but for a mistake, not bad. This is the first part of a two part post on two wild brook trout streams. These streams are about six miles apart and flow through a pine, hemlock and hardwood forest. The streams have almost the same type of structure consisting of plunge pools, large boulders, small rocks and runs and riffles. The insect life is about the same for these small streams caddis, mayflies, but the hatches are not as prolific as some of the larger rivers in Connecticut, and lots of land based insects. I selected my number one fly for small streams a Bomber in an attempt to bring a brookie to the surface. Fishing the likely holding places I sent the Bomber prospecting. It wasn't long before the fly worked its stuff. A splashly rise and a miss. This same thing happened many times that day, but it also produced several hookups. One of the solutions to cutting down on the short strikes was to use a wet fly, a Picket Pin. They seemed to readily take the fly and the hookups were better. This is the difference in brook trout in the two streams. The brookies in this stream are very dark, some almost black. They say that a brook trout takes on the colors of the stained waters they live in. This stream was tea colored. This fellow liked the Picket Pin. I love these pools. They always hold a trout or two, and they are just beautiful to look at. These are a few more of the dark colored brookies the live in this stream. Here's one that I managed to take the Bomber. If I fished this stream all day and never caught a fish it would be a successful day.